Dr KK Tse interviewed with Kelvin Cheung, Founder of FoodWorks in Dec 2009. Born in HK, brought up and educated in Canada, did postgraduate studies at London University, founded FoodWorks to address the issue of food poverty in an apparently affluent society. FoodWorks combines young volunteers, surplus food and a free kitchen space to create nutritious meals for people affected by food poverty. The idea is simple. Food retailers throw out millions of tons of edible food every year due to supply overstock. The aim of FoodWorks is to redirect this food so it can be used to cook nutritious meals for people in the local communities that do not have access to healthy foods for a variety of reasons, such as lack of income or knowledge of healthy nutrition. The result? Personal health and well-being increase with proper nutrition, food waste is reduced, and young volunteers create positive change in their communities! KK: Could you tell us something about your background? Kelvin: My background has been varied. I was born in Hong Kong and moved to Canada when I was only 6. I still remember my first day at school, and how scary it was when I was the only Chinese kid in the class. Most of my education has been in Canada, and I believe that has really given me the knowledge, but more importantly, the inquisitive mind and the confidence to take me to where I am now. I believe that education isn’t about remembering all the facts to a subject, rather, it’s about learning about how to ask questions about the world around us and just asking ‘why?’ We don’t ask this question enough. Most often, we just take things as they are, well, I think that just is not acceptable. And if it’s not acceptable, go do something to change it! KK: What did you study at university? Kelvin: I studied history and geography in my undergraduate degree and did International Development in my Masters at the School of Oriental and African Studies, University of London. I believe that history is one of the most important subjects a person can study, and it doesn’t matter what career you want to be in. So much has already happened before, many mistakes have been made, and without knowledge of these mistakes, we are just going to make them again and again. KK: Why did you choose to be in the social enterprise sector rather than pursue a conventional career? a) I like to do something that makes a profit as well as doing good for the world and its inhabitants, and not just one or the other. b) I love the people that are in the sector. There are many young, passionate minds with genuine hearts that are both ambitious but want to do good. When I go to work, it’s not work, as it’s fun, and well, when work is play, what more do you want?! c) I can wear whatever I want at work! KK: What is the nature of the social enterprise you set up? Is it self-sustaining? Kelvin: FoodWorks puts together young volunteers, surplus food and a free kitchen space to create meals for people affected by hunger and malnutrition. So, basically, we are creating value out of things that would have gone to waste. That being said, I would challenge anybody eating our food to tell the difference between ours and the same meal made from purchased ingredients. We throw out perfectly good food. That’s how crazy the system is, and that is why we need to change it. In regards to sustainability, we are planning to become self-sustaining as the company grows through a variety of revenue generating sources. Right now, we are mainly relying on grants to make the operational model work first. It will be a challenging issue for us as the food we use is ‘donated’ to us, thus we cannot charge money for the meals, as it will be unethical. However, we have several avenues we are looking into to generate income to be sustainable. KK: Who are the young volunteers who cook the food? What motivates them to participate? 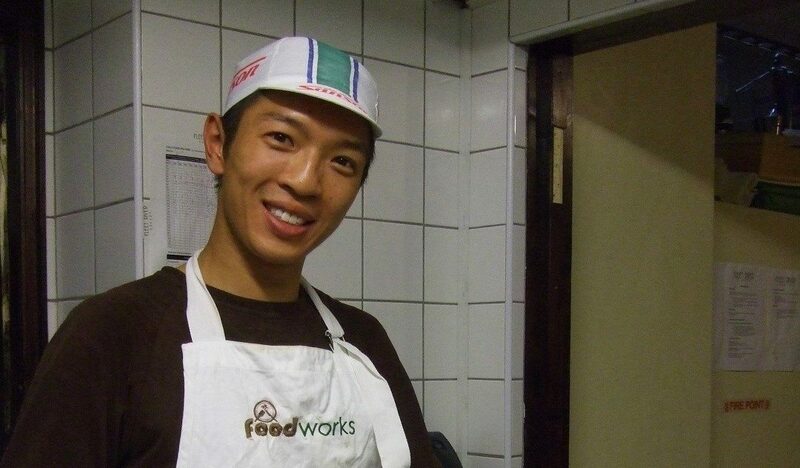 Kelvin: The young volunteers that come to FoodWorks to help come from all backgrounds. They are usually motivated by the same values that motivated me to start this, which is enjoying cooking, wanting to give back to their community and being frustrated about the amount of food waste in the country and wanting to do something directly about it. I definitely feel that there is a very special atmosphere of fun, creativity, hard work (peeling 50 potatoes or dicing 50 courgettes), learning (ever cooked a Spanish omelette for 50?) and giving back to the community that keeps the volunteers coming back. KK: Who provided the free kitchen? Kelvin: Just think about all the corporate offices, weekday cafes, churches and community centres that have kitchens that are sitting idle out there right now. All kitchens can’t be used 24 hours a day. So we just find one that works for us and use theirs. It doesn’t cost them anything to give the space to us, and it can be their way of giving back to the community. KK: Who consume the food? Why is the food important to them? Kelvin: It’s not a widely known fact, but 4 million people in the UK are affected by food poverty, which means that they don’t get a healthy balanced meal a day. I think there are few people who are actually starving, but the number of people who are malnourished is the highest it has ever been (on a side note, it was during World War 2 Britain, during rationing, that Britons ate the healthiest). I had a doctor who told me that in his practice, he diagnosed a 14 year girl with iron deficiency… she had an iron level of 2. What does this mean? Well, let’s put it this way, he has never seen a level that low, except in a Red Cross refugee camp in Sub-Saharan Africa. This is just simply unacceptable in the UK, especially when there is so much food waste as well. So the people we work with can be anyone ranging from young children, the homeless, refugees, to seniors in care. The food is important because we are what we eat. Food isn’t just food. There is food that is fresh and packed full of vitamins and minerals and is natural. Then there is food that is crap — meaning heavily processed, full of nutritionless calories. The body can still function, but not for very long, and not very well. How would you feel if you just ate KFC and McDonalds for one week? There are people who are eating this every day, every week, every year! KK: What social impact do you want to create? Kelvin: We want to set up FoodWorks projects all across the UK, in communities where there is both food waste and food poverty. With 10 million tonnes of food going to the garbage every year and 4 million people affected by food poverty, this basically means in every major town and city, we can set up a project. With support from us, we will empower young people to create their own projects in their community, so they will gain the confidence and hope that what they do does matter, and that they can change the world if they wanted to ! KK: What make you so passionate about it? Kelvin: I am so passionate about FoodWorks because I don’t have a lot of patience and want to ‘fix’ things. In the UK, a land of abundance and wealth, that food waste and food poverty can exist side by side, in the same community. It doesn’t make sense, and we need to change it. KK: What have you learnt from the experience so far? a) Surround yourself with good people who believe in you and support you. There will be those that doubt you and what you are doing. Leave them. Find new friends and colleagues that will support and work with you. You can’t convert everyone or make everyone like you and your idea. Try once, try again, and then just let them be. b) Asking for help from others is not a sign of weakness. FoodWorks got to where it is now not only from my work, but from the experience and wisdom of so many people who were kind enough to take the time to talk to me and advise me. The best advice I’ve gotten so far is not from a book, a course or a meeting; it’s been over a cup of coffee. c) Balance. Working hard is important to make something succeed. However, this often comes at the cost of our personal lives. Try to create a balance, even if it means that you will have to set less ambitious targets. Getting very little sleep, working long nights, eating crap food and not staying in shape… it might make sense, and I know that’s what we are all supposed to do… but all those things build up and ultimately, it will hurt yourself and your business. KK: Why did you do it in the UK, and not HK or China? Kelvin: Life is a journey, and right now, it’s in the UK. KK: What are your future plans? Kelvin: Define future? The next several years will be making FoodWorks a sustainable social enterprise in the UK. After that, who knows!